An explosive kit for exploring energy can be purchased from Educational Innovations. The Piezo Popper Kit (HS-2A; $7.50) is a simple fuel-powered engine that is triggered with a piezoelectric igniter. Just fill the supplied film canister with two drops of a flammable liquid propellant, seal the canister, shake it (shaken, not stirred), and press the igniter. POP! The resulting explosion can catapult the film canister up to ten feet away from the startled scientist. Antacid tablets like Alka-Seltzer® are potent rocket propellant systems. I kid you not. 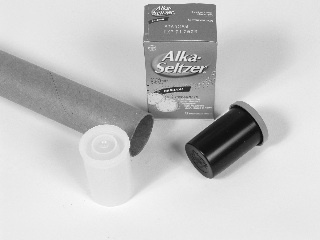 In addition to the antacid tablets, you will also need an empty 35mm film canister. These two items are your engine mount and propellant. Optionally, you can add a rolled paper tube that will snuggly and safely hold the engine (film canister). In my tests, I found that Fujifilm canisters are the best engines. Now, rather than adding two drops of a flammable liquid, add measured amounts of the antacid tablet + measured volumes of water and record the mass of the canister and the height attained by the flying canister. You can apply these measurements to the same calculations used in the Piezo Popper Kit. Compare the results from a flammable canister’s flight versus an antacid-fueled voyage.